Since going public in 2001 devotion to Santa Muerte has spread rapidly beyond Mexico to the four corners of the globe. In the piece below anthropologist Dr. Kate Kingsbury* reveals the robust presence of the Bony Lady in Toronto, Canada’s largest city. In the middle of bustling Toronto, Kensington Market offers respite from the gray skyscrapers that loom like belligerent giants over much of the city centre. Reputed as a bohemian neighbourhood, the vibrant market is replete not only with vintage stores and hipsters but also people from the Global South selling ethnic wares and victuals in colourful storefronts that blast out cumbia, reggae, soca and other tropical beats. Numerous South American stores pepper the streets, and in the eateries one can find every Latin dish from tamales to tacos. The thriving Latino community consists largely of Mexicans, as well as Argentineans, Salvadorians, Colombians, Chileans, Guatemalans, to name but a few, and where there are Latin Americans there are folk saints. As I roved the neighbourhood exploring the shops, I descried Virgin of Guadalupe iconography on display in numerous shops and upon enquiring in one of them I was told such items were not for sale but belonged to el dueño, the owner. In one tienda latina, a lit votive of Saint Jude flickered above the cash register. I wondered where such paraphernalia came from, and indubitably much of it had been imported but some items had been bought locally. International Herbs is the largest of the multiple locales selling incense, herbs and devotional items in Kensington market. It is within this shop that one may find talismans, ikons, relics, grimoires and other accoutrements for use in orisons and sorcery. As I perused the occult oils, magical dusts, the crystal gems and books of spells, my gaze was drawn to the top shelf above the till which was overshadowed by a dark, skeletal figure. My eyes met with a large statue of Santa Muerte garbed in her black robe known for its association with imprecation and pernicious petitions. I asked the store owner if I could take a closer look at the figure and he gently but deftly removed the Skeleton Saint from the safety of her elevated shelf for my inspection upon the counter. The female personification of death stood clutching not the archetypal globe in her right hand, but a translucid glass sphere as her scythe whorled high above her left shoulder. I enquired what other Bony Lady devotional items the owner had on sale. He explained that he also offered Santa Muerte in white apparel. This is the colour of protection, cleansing and clarity. The owner related that he had no more of such statues for the last White Sister had been recently purchased by a Mexican devotee. Numerous votives were available on the richly stocked shelves from candles depicting orishas of Santeria to votives decorated with both Catholic and folk saints such as San Judas, Santo Nino de Atocha, San Alejo, San Pedro, and of course Santa Muerte, however only the white votive remained. The shop owner explained to me that he had sold out of the other Santa Muerte veladoras which had gained great popularity in recent years, especially amongst the Mexican community. He reported however that his Pretty Sister clientele also encompassed other Latin Americans and even some locals. The shop owner stated that he had until recently sold the Santa Muerte 7 Day Bath Oil Kit, ‘Semanario De Esencias De La Santisima Muerte’ which supplies the supplicant with the succour of a week of invocations for good luck, abundance, health, protection from envy (contra envidias), work and finally peace and home (paz y hogar). Once again this best seller had disappeared from the shelves due to high demand but if interested I was told items could be ordered in. This was not the only shop to sell Santa Muerte paraphernalia as was related to me by an Argentinean shop owner located down the street. She sold amongst other wares, a pamphlet dedicated to la Dama Poderosa (Powerful Lady) with prayers and mythology. This leaflet, she attested, was one of her most popular items. When I asked her as to her outlook on the Skeleton Saint she responded that she had respect for her but did not invoke the Bony Lady unlike many of the local Mexicans whom, she avowed with animadversion, might not openly proclaim their devotion but behind closed doors invoked Santa Muerte for all manners of dark works, hechizos de magia negra. Although she claimed not to be a devotee of the White Girl she was well aware of the statues and votives on sale at the local botanica and even knew of the price of the various items, ipso facto I couldn’t help but question her enunciation that she kept her distance from the Skeleton Saint. As an anthropologist I was intrigued to find further evidence that Santa Muerte’s notoriety and popularity is truly global in scale. As evinced by Professor Andrew Chesnut the movement has grown more rapidly in the last decade than any other new religious movement in the Americas. The fact that Santa Muerte paraphernalia was sold out in the botanica and that her statue, as testified by the shop owner, was the only Latin American folk saint figure he stocked due to the constant demand, further attests to the fact that in Toronto, as across the world, she boasts a reputation for being rapid and efficacious in her response to petitions. 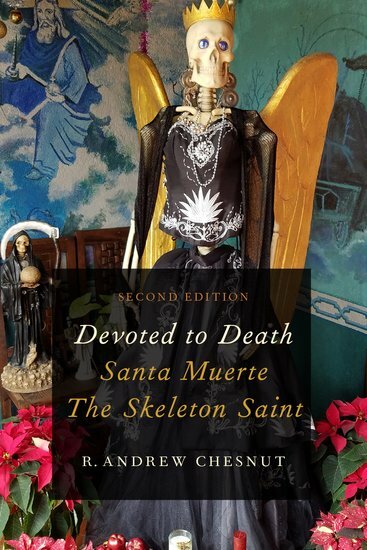 Nevertheless, much as I encountered in Oaxaca, Mexico, devotees who turn to Santa Muerte are viewed with suspicion, and even deemed to be in collusion with a demoniacal force and thus chose to keep their devotion a private matter. It is little wonder that the subject was broached with extreme caution by the vendors of Kensington Market and although a lit votive of St. Jude and iconography of la Virgen were publicly visible in most Latin American shops, there was no evidence of Santa Muerte worship, despite the fact that the Argentinian store owner confessed that she had heard that many local store owners were secret acolytes. As Santa Muerte is known as a folk saint turned to, as mentioned previously, for all manners of supplication including those more nefarious requests, orisons and obsecrations take place behind closed doors. In an almost Faustian twist, devotees are often accused of being in un pacto satanico, a satanic pact that comes at a potentially high cost of unsurmountable misfortunes should one fail to propitiate The Bony Lady as she sees fit. The idea of Santa Muerte as a diabolical figure has been further bolstered by Pope Francis’ denunciation of the Skeleton Saint as a harbinger of evil. But the covertness of rituals and the tenebrous reputation of the Lady of the Shadows does not detract from Santa Muerte’s popularity. Au contraire, I have concluded that the folk saint’s success indubitably stems in part, from devotees’ desire to adopt in their rapports with her, what Georg Simmel termed a dichotomy of concealment and revelation, which are at the fulcrum of his work on secrecy. This interplay creates ambiguity and mystery adding to her mystique, infamy and to the idea that devotees who are able to gain her favours, even if at a risk may be rewarded with access to a dangerous but powerful world of puissant, invisible forces that when properly harnessed can ensure one access to great wealth, love and all other manner of material and metaphysical desiderata.